Some Baby-Boomer-leaders wonder how to hold those irresponsible Millennials accountable. Don’t ask for reasons why something wasn’t done, if you don’t want to hear excuses why something wasn’t done. “Why didn’t you follow through?” is an invitation for excuses. What kind of conversation does, “What happened?” call for? Face it. There’s always a “good” reason when someone didn’t finish a task. Don’t ask to hear it. #2. Don’t have the same conversation two or three times. When someone doesn’t finish tasks, don’t expect anything to change until you change what you do. The same conversation will yield the same disappointing results. “Hope” doesn’t magically change performance. In reality, hope often prolongs poor performance. You prolong poor performance by sending signals that poor performance is OK. Leaders who don’t give second chances create cut-throat, over-protective, slow-moving teams. Ask, “On a scale of 1 to 10 how important is this to you?” If the number is acceptable, ask, question five. If the number is too low, discuss values. 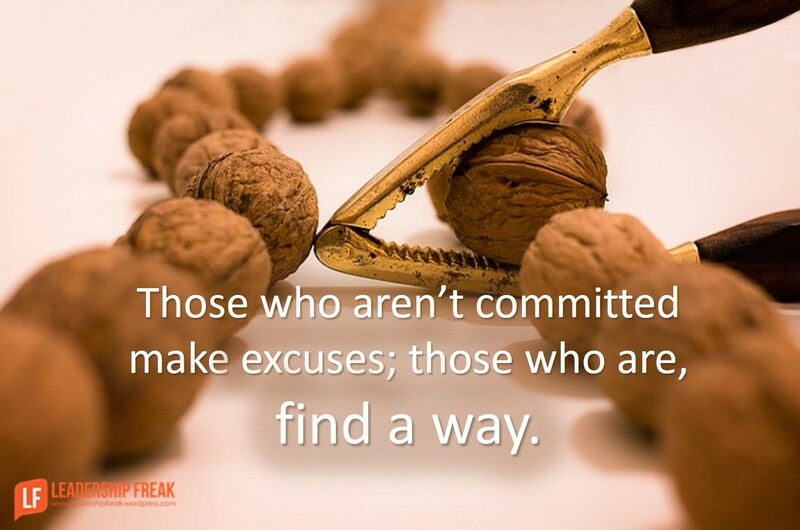 Those who are committed find a way. Those who aren’t committed make excuses. #5. Double check for clarity. #6. Ask the power question. Listen for specific behaviors, not wishful thinking. Next time will be like last time, if they leave your office with the plan they used last time. #7. Create consequences with them. Go with their response, if it’s acceptable. Add or subtract consequences if theirs is too harsh or soft. How might leaders hold people who have fallen short accountable? The rest of the post does not come up to read. Thanks! Hi Dan, when I select “Read more of this post” from my email, your post is not displaying. Only the comment section. Good stuff, Dan. As a gen-X-er myself, I used to find things in common with the Boomers as well as the Millennials, but more and more, it’s harder for me to understand the attitudes and often lack of personal responsibility that I often see within this group. That said, there’s a ton of talent and potential there, so input like yours is valuable for sure. The topic of managing Millennials in general is a common one throughout my industry, and I’m glad that people are recognizing that leadership for this group is optimized by adjusting the approach as opposed to simply accommodating the perceived shortfalls as “the new norm” or expecting them to automatically assimilate to the world that most of them weren’t properly prepared for. Thought you would like to know the link is broken in the post. I cannot see the post – only the title and date. Has the post been removed? Dan! I’m breathless with anticipation about what this post was going to reveal!! Is it just me or is anyone else unable to see anything more than the title? I’m just landing in Phoenix. I’ll look into this ASAP! Perhaps one day, you will visit. I cannot access the post either — just the comment section. I don’t see the post and I don’t see any comments. Does this mean that we can’t hold millennials accountable? It does seem that way at times and other times they’ll really surprise you. When I get off the plane I’ll do my best to fix this. I think that Rian is clairvoyant, couldn’t read it either, but last night on tv, they mentioned that Millenials outnumber all of us. I don’t think that I fit into any group, all that I know is that they truly display a sense of entitlement, and it does worry me. Especially with a huge election coming up. They think that they deserve free college, when I know that I had to pay for my own. I really want to read this article, but all I see are comments from others. Please help me. I’m not enlightened enough to be Zenish. Dan the second time I tried to open the Post it worked, if that helps. As to Millennials, they are now equal in potential voters to our older Boomer group. We had dinner recently with 4 young Millennial college women. I asked who they liked in this presidential election. One for Clinton, One for Kasich, Two for Bernie. It is a new world and they will soon be in charge! And the Boomers have never made an easy transition yet. Thanks Brad. I boarded for Philly and set my personal hot spot up. I’ve updated. I hope it works now. This was so worth waiting for, Dan! #7: Magical. I actually grinned and chuckled as I read it to myself. Thanks. Thank you for your great insights. Now, if those in leadership above those of us who give the feedback to millennials would be supportive, that would really help to effectuate positive change and signal that delivering on commitments IS important in the workplace. Same problem here – the rest of the post does not come up on the site. It sounds like a very worthwhile post, though, so I’m hoping the issue can be resolved. Thanks! Dan – Thank you for getting the post corrected. it was well worth the time to read! Thanks David. My pleasure. Thanks for the kind words. I think this list is applicable for all – it’s not limited to a single generation. Thanks Lee. The title is a little tongue-in-check. You are exactly right. Many Boomers shouldn’t be in leadership. To make matters more challenging, the autocratic style that is more suited to Boomers, is working less and less in today’s world. You are just stating facts. I didn’t read judgement in your comment. Please don’t read judgement in mine. I’m thankful you stopped in today. Well, what the heck, why not blame the baby boomers for raising the next few generations, make them accountable for it, right? Then no need to come up with some lame ‘excuse’ for not to commit! Excellent and very practical. Holding people accountable in healthy ways is probably one of the most challenging aspects of leadership there is. Dan, Accountable for everyone is lacking today, I hold myself accountable everyday and I expect the same from my workers! If the incidents you have described we have a meeting and we discuss as a team or one on one, and review the issues! Many times conditions develop that we don’t see or prepare for, you regroup and conquer! Somethings are not controllable, much of what you have described is! Thanks Tim. Really, the only true accountability there is, is self imposed. We can help others own it, but you can’t make them. It takes leadership to help others hold themselves accountable. Great advice on accountability regardless of generation. Favorite insight: Those who are committed find a way. Those who aren’t committed make excuses. As I look back, this has been and always will be 100% true. Being a new manager, (and a millennial leading and managing millennials,) I found this post very practical and helpful. I also found some opportunities in it for myself to grow as well! Great questions to use in those difficult conversations. Brings awareness, sheds light on reality and the expectation for things to change. Being a member of Gen-X, all I can do is shake my head thinking that someone should have asked the Baby Boomers this about a variety of issues, from economic chaos (Lesson learned from Enron? Nah, let the Recession Commence) to war (oh boy, this attempt at Western-centric warfare in Asia will succeed, regardless of what history says) to the state of the environment (burn baby burn). Every generation has it’s flaws, but unless its not painfully obvious, the degeneration of the national infrastructure, assault on sound science, disruption of the space program, and the fundamentalist infiltration of state and local government and the associated legislation based in fear (bathroom bills, for example) aren’t originating with people who remember McHale’s Navy or F Troop on TV in OR out of syndication. Baby Boomers have made themselves deaf to it, but’s a well know mantra in the under 50 set that this country will change, and for the better, once the great die-off starts and those of us who never had Archie Bunker as an archetype go off to their just rewards. aren’t originating with people who don’t remember McHale’s Navy or F Troop on TV in OR out of syndication. This is great. When I read this I felt like I could apply this to keep myself and my peers accountable for group efforts. Thanks Dan, I now have another lens to use when inspecting myself. Dan, could you do a post about how to build an organizational culture that maximizes the strengths of millennials?